Baron Milford [1744-1823; Lugt 2687], Pembrokeshire, as by Pietro da Cortona. Anthony Blunt [1907-1983], London; (Martin and Sewell, London, by 1970); Joseph F. McCrindle [1923-2008], New York, 1970; bequest to NGA, 2008. The Sir Anthony Blunt Collection. Courtauld Institute Galleries, London, 1964, no. 26. Master Drawings. W. A. Martin and Brian Sewell, London, 1970, no. 22. 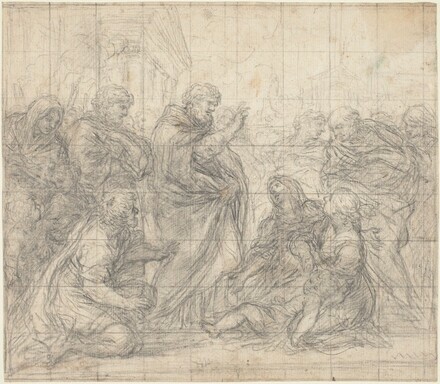 Italian 17th Century Drawings from British Private Collections. Edinburgh Festival, Edinburgh, 1972, no. 48. Old Master Drawings from the Collection of Joseph F. McCrindle. The Art Museum, Princeton University, Princeton, New Jersey, 1991, no. 49 (cat. by Frederick A. den Broeder). The McCrindle Gift: A Distinguished Collection of Drawings and Watercolors. National Gallery of Art, Washington, 2012, 64-65, no. 21 (entry by Oliver Tostmann). Vitzthum, Walter. "Review of The Sir Anthony Blunt Collection Exhibition Catalogue." Master Drawings. 3, no. 4 (1965): 405. Davis, Bruce W. The Drawings of Ciro Ferri. New York, 1986: 238. Harris, Ann Sutherland. Review of Frederick A. den Broeder, Old Master Drawings from the Collection of Joseph F. McCrindle. Master Drawings 32, no. 1 (Spring 1994): 68.